I hollowed out the inside of the top today. It was SO much easier to do than the maple!!! The spruce really did carve like butter, compared to gouging out the maple. To the left is the final result. 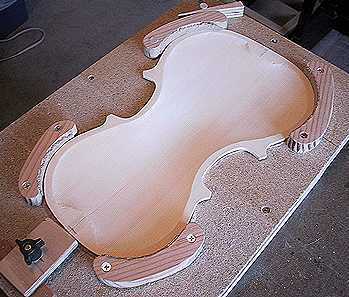 Below, I just couldn't resist setting the top and back together with the rim, to get a picture of how my violin body will soon look. 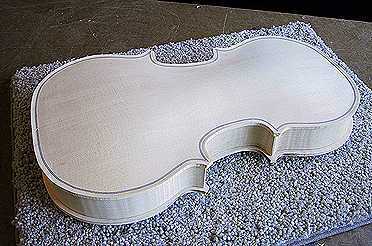 The next thing I need to do is carve the f-holes; that should be fun. Then I may get back to the neck and carving the scroll!